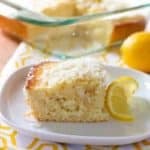 This snack cake is bursting with lemon and coconut! Sometimes you just don’t need a full size cake, but you NEED cake never the less! Did you know that you can bake most any muffin recipe in a 8 x 8 pan and turn it into a snack cake? Yup, it’s true! I mean aren’t muffins just portable cake anyway? I love muffins but I hate cleaning the muffin tin…besides, I love me some cake! I found this recipe on Taste of Home. Burst o’ Lemon Muffins! How cute is that! But the recipe called for coconut and I thought it deserved the same billing as the lemon hence the Lemony Coconut title. I added a bit of coconut extract to the mix as well to define the taste even more. The warm cake is topped with a liquid citrus sugary thingy…similar to my Orange “Brownie” recipe. It makes for a really moist and flavorful little snackety, snack cake! Oh boy, too much sugar…cake does make me talk stupid! We love this Lemony Coconut Snack Cake on days a whole cake is just too much! If you don’t have coconut or lemon extract – it’s okay! It tastes good with just the lemon zest and lemon juice. If you use greek style yogurt, thin it with two or three tablespoons of milk or your batter will be a bit dry. Also, I see no reason you couldn’t add some blueberries to this…Coconut, Blueberry Lemon snack cake! Why not?? 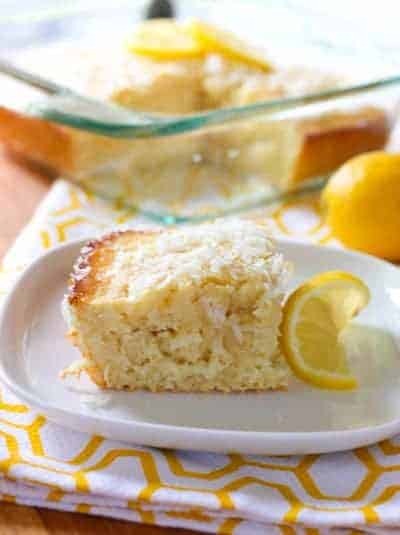 This Lemony Coconut Snack cake is just the right size when a whole cake is too much! Bursting with lemon and coconut flavors, we love this cake! Coat an 8 x 8 cake pan with cooking spray. In large mixing bowl combine flour, sugar, baking powder, baking soda and salt. In small mixing bowl, combine yogurt, egg, melted butter, lemon zest, lemon juice, extract and coconut. Add wet ingredients to dry ingredients and combine - do not over mix. Remove from oven and add topping while cake is still hot. combine all ingredients in a microwave safe dish and microwave for 1 minute. Stir and cook another 30 seconds until all sugar is dissolved. Poke cake all over with a fork. Using a spoon drizzle toping over hot cake. This cake looks like it has such a bright flavor! I can’t wait to try it! This looks absolutely divine! I’m bound for Hawaii early tomorrow morning, so I have the tropics on my mind. Your lemon+coconut combination is making me wish tomorrow would come sooner haha! you can never go wrong with a good homebaked lemon cake! definitely craving a slice right now.. looks delicious.